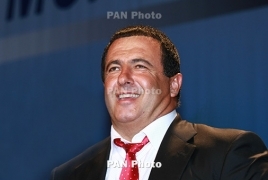 PanARMENIAN.Net - Nothing has changed so far, even when Tsarukyan announced in 2015 that he will quit politics and henceforth the party he founded. Naira Zohrabyan, who replaced him as a chairperson, confessed that they had always been met in rural settlements as “Tsarukyan’s parliamentarians”. PAN will dwell on Prosperous Armenia’s activity as a coalition and opposition party. Prosperous Armenia (PA) party was founded on April 30, 2004 by entrepreneur, sports advocate and sponsor Gagik Tsarukyan. At first, many linked the new party to Armenia’s second President Robert Kocharyan, although the party members used every opportunity to refute the opinion. The parliamentary elections in 2007 were a premiere for PA: it gained 17% of the votes, forming a coalition with the Republican Party of Armenia (RPA), which got 30% of the votes and Dashnaktsutyun party, which won 15%. During the 2008 presidential elections, Prosperous Armenia party backed Serzh Sargsyan. The next year, the party’s rating was steadily growing. In the 2009 Yerevan municipal council elections, PA garnered 89,131 votes (22%). It’s noteworthy that after the municipal elections, the leader of the Armenian National Congress (ANC) Levon Ter-Petrosyan called on Dashnaktsutyun (which had quitted the ruling coalition because of the Armenian-Turkish reconciliation protocols by that time) and Prosperous Armenia “to unite and jointly struggle against the regime of Serzh Sargsyan.” However, PA refused the proposal to form a united opposition bloc. “Prosperous Armenia is a part of the ruling coalition and is not joining any opposition movement,” party secretary Aram Safaryan said. Partially oppositional Tsarukyan, meanwhile, stayed true to the Coalition Statement and didn’t take part in the presidential election, won by incumbent Sargsyan. Prosperous Armenia participated the 2013 Yerevan municipal council elections, winning about 17% of votes. In 2014, then-Prime Minister Tigran Sargsyan resigned to be replaced to Hovik Abrahamyan, while Tsarukyan and his party joined Dashnaktsutyun, ANC and Heritage party as an anti-governmental force. The so-called union of four parties became a three-party bloc several months later, when Dashnaks started constitutional talks with the ruling RPA and consequently agreed to form a coalition government, receiving 3 ministerial posts. What happened next? Two days later PA member Artak Khachatryan, an active participant of opposition rallies, was kidnapped and beaten. In a statement, the party described the incident as “an impudent and cynical challenge to political forces and society. The country’s leadership bears full responsibility for this act of violence.” In a while, during his address to the RPA council meeting, President Sargsyan said “it’s high time to put the haughty, ignorant and strayed on heels. It’s time for certainty and resolution of political issues and will start this process today. As a result, after a month of his for the regime change, Tsarukyan announced that he quits politics and his Prosperous Armenia, transferring the reins of power to Naira Zohrabyan. “Taking into account the challenges our country faces, as well as the calls for my return, I reopen the page I once closed and announce participation in the 2017 parliamentary elections. Our alliance will welcome all political forces and figures, who care for the future of our country,” he said.